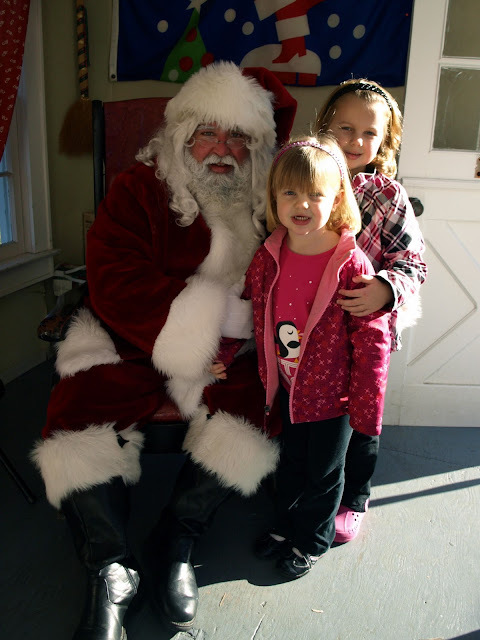 This Sunday we paid Santa a little visit at his cottage in Madison. I told the girls I wasn't sure if he would be visiting Madison on a Sunday afternoon (ya know... because on Sundays he might like to spend some time at home with Mrs. Claus and the elves.) but his doors were open and he was ready for visitors. After the initial greetings of "Ho, Ho, Ho!" and "Well, who do we have here?" Ana took her turn checking out Santa. She didn't do much other than nod her head and look at him with shock and awe. If he wasn't holding onto her hand to keep her close she would have immediately hid inside my coat. When Santa asked Ana what she might like for Christmas she brought out her itty bitty small quiet voice. So he pulled her a little closer to see if he could hear her. No luck. She did nod her head when I said "Didn't you tell me you wanted to ask Santa for a Strawberry Shortcake and all of her friends?" Then it was Zoe's turn. She was pretty serious about the business of answering Santa's questions about how good she's been. If she's being a good student. If she's listening to Mommy and Daddy and her teachers. Then he asked her what she might like for Christmas. Yep, Santa... that's the same look I gave Zoe when she told me she was going to ask you for a pogo stick. Santa shot me a quick look (the one where he makes sure Mom is OK with him agreeing to said pogo stick... or if he should talk the kid into something else). Then Santa and Zoe had a little talk about helmets and elbow pads and knee pads. Santa is VERY safety conscious. After finishing up our talk with Santa we said our goodbyes and told him we would make sure there was a snack for him and the reindeer when he stopped by on Christmas Eve. Zoe and Ana both took a turn signing their names to Santa's guest book. We stopped to check out Santa's sleigh... and tried to take it for a little spin. I think Zoe and Ana were hoping that they could drive the sleigh home. I guess only Santa has that special magic... which is OK. I don't know where we would park a sleigh anyway. And how would he bring us a pogo stick and Strawberry Shortcake without his sleigh?